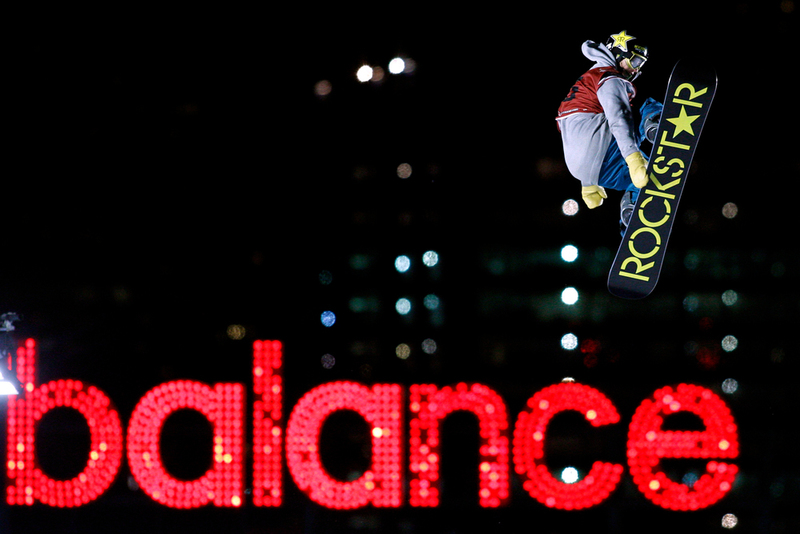 Charles Guldemond of the United States launches off the ramp during practice for the Big Air Grand Prix snowboard competition at Fenway Park in Boston, Massachusetts on on February, 11, 2016. Wilson Montalvo (L) of Worcester chases after the ball during a game of handball with Jose Lopez (2nd-L), Raul Vazquez (2nd-R) and Steven Ramsey (R) at Crompton Park in Worcester, Massachusetts on August 24, 2017. New England Patriot head coach Bill Belichick heads off the field after the Patriots defeated the Tennessee Titans 33-16 at Gillette Stadium in Foxborough, Massachusetts on December 20, 2015. Boston Red Sox pitcher Koji Uehara celebrates with his teammates after winning the ALCS against the Detroit Tigers at Fenway Park in Boston on October 19, 2013. New England Patriots quarterback Tom Brady (12) leaps over the middle for a one-yard touchdown in the second quarter of the AFC Divisional Playoff game against the Kansas City Chiefs in Foxborough, Massachusetts on January 16, 2016. Middleweight Mark DeLuca (L) of Whitman connects for a punch on Ryan Davis in the third round at the Monster Brawl at Pilgrim Memorial Hall on Thursday , October 30, 2014. DeLuca knocked out Davis in the fourth round. 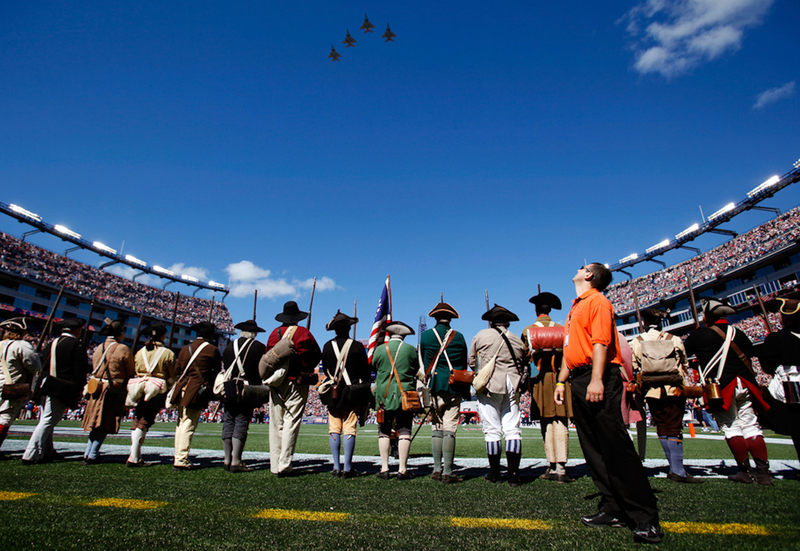 A Gillette Stadium security detail watches jets flown by the Massachusetts Air National Guard as they perform a fly over of the stadium before the game between the Arizona Cardinals and New England Patriots in Foxboro, Massachusetts on September 16, 2012. 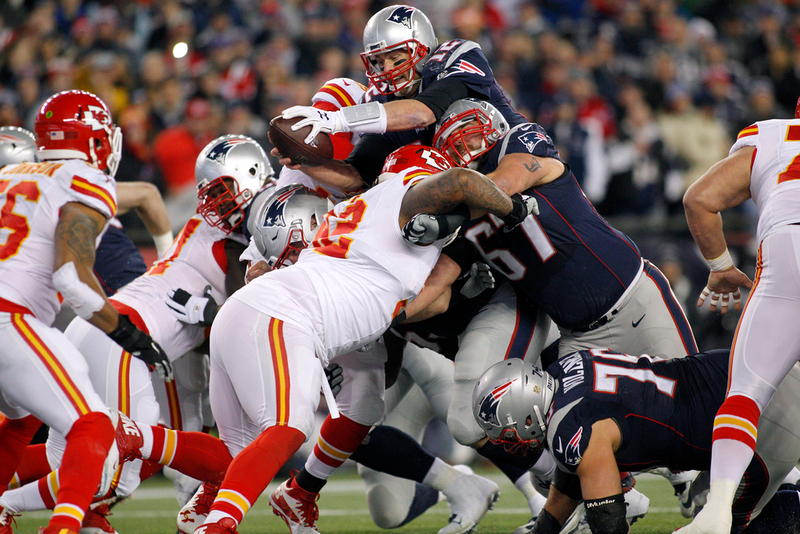 The Cardinals defeated the Patriots 20-18. 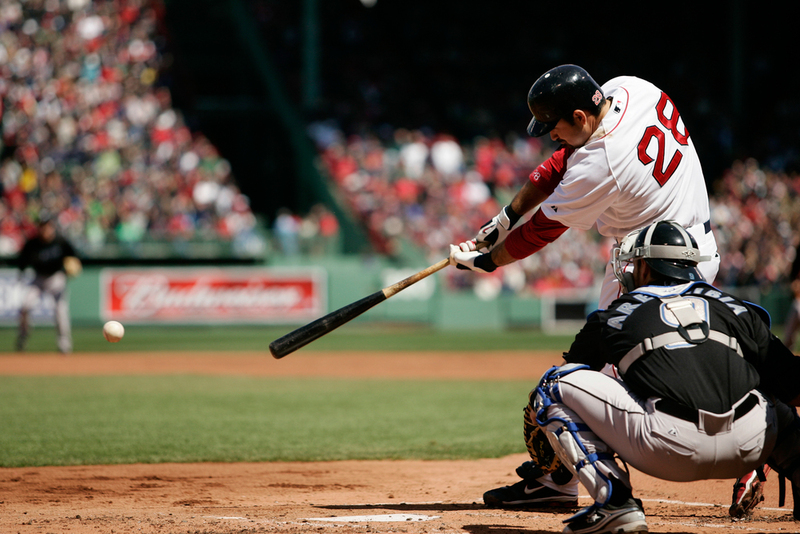 Boston Red Sox center fielder Jacoby Ellsbury (R) and right fielder J.D. Drew take the field in the throwback uniform at the opening of the game against the Chicago Cubs on Saturday May 21, 2011 at Fenway Park in Boston. Boston Bruins center Patrice Bergeron (37) and Philadelphia Flyers center Mike Richards (18) chase down a loose puck in the third period of the 2010 Bridgestone NHL Winter Classic at Fenway Park in Boston, Massachusetts on New Years Day, January 1, 2010. The Bruins defeated the Flyers 2-1. New England Patriots wide receiver Deion Branch reaches for a ball in the endzone while under pressure by Baltimore Raves cornerback Chris Carr in the fourth quarter at Gillette Stadium in Foxboro, Massachusetts on October 17, 2010. The Patriots defeated the Ravens 23-20 in overtime. Old Rochester High senior Brent Rezendes (C) cheers for his team before they take on Hoosac Valley High in the MIAA Boys Division 3 Championship game at DCU Center on Saturday, March 14, 2015. New England Patriots fans take part in a stunt card event in the second quarter of the game against the Washington Redskins at Gillette Stadium in Foxborough, Massachusetts on November 8, 2015. The Patriots defeated the Redskins 27-10. Boston Red Sox Adrian Gonzalez connects for a single in the first inning against the Toronto Blue Jays at Fenway Park in Boston on April 17, 2011. 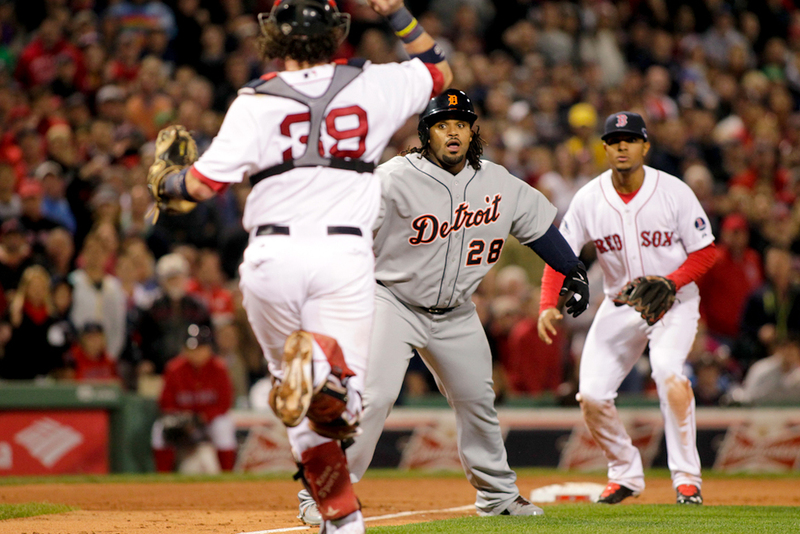 Detroit Tigers runner Prince Fielder (28) is chased down by Boston Red Sox catcher Jarrod Saltalamacchia (39) while third baseman Xander Bogaerts (72) waits at third base after Tigers batter Jhonny Peralta (not pictured ) grounded into a double play in the sixth inning of game six of the ALCS at Fenway Park in Boston on October 19, 2013. New England Patriots quarterback Tom Brady (12) stands in a shaft of sunlight during the second quarter against the Washington Redskins at Gillette Stadium in Foxborough, Massachusetts on November 8, 2015. The Patriots defeated the Redskins 27-10. Boston Bruins goaltender Tim Thomas (30) lays on the ice after giving up a goal to Washington Capitals forward Mike Knuble (off camera) in the third period of game five of the NHL Eastern Conference Quarterfinal TD Garden in Boston, Massachusetts on April 12, 2012. The Capitals defeated the Bruins 4-3. 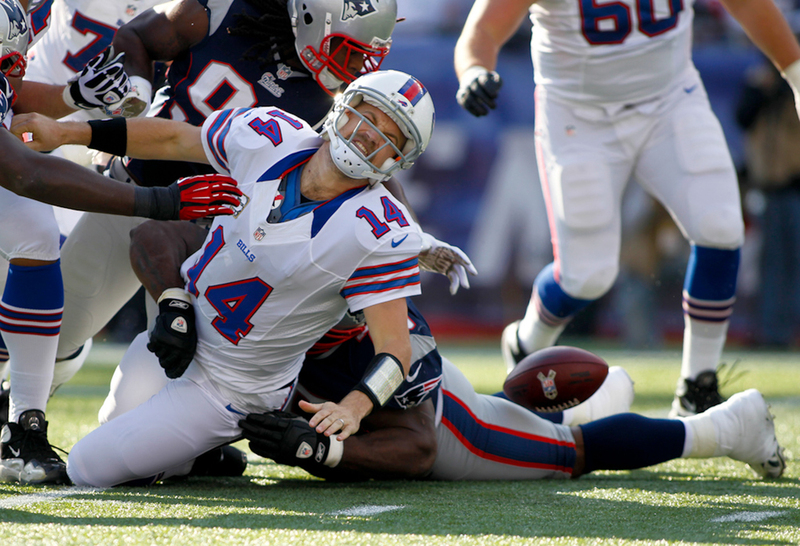 Buffalo Bills quarterback Ryan Fitzpatrick (14) fumbles the ball as he is sacked by New England Patriots defensive lineman Vince Wilfork in the first quarter at Gillette Stadium in Foxboro, Massachusetts on November 11, 2012. 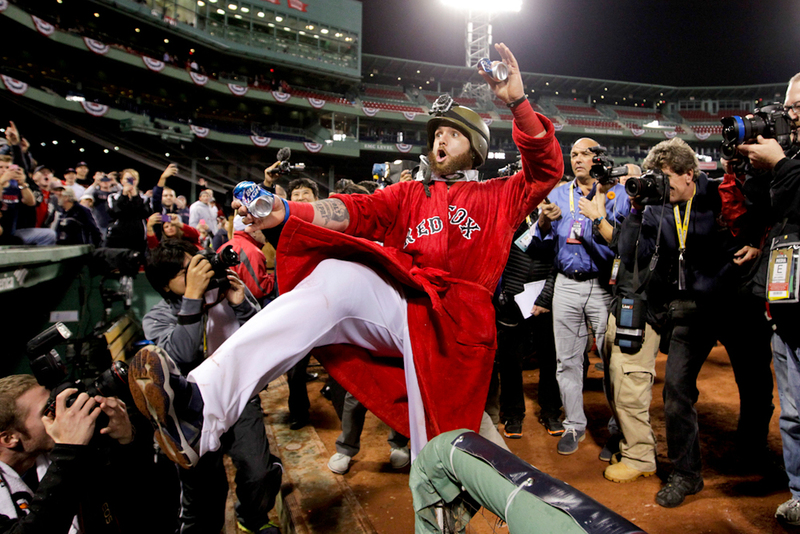 Boston Red Sox left fielder Jonny Gomes celebrates after the Red Sox won the American League Championship after defeating the Detroit Tigers in six games at Fenway Park in Boston on October 19, 2013. Boston Red Sox left fielder Daniel Nava leaps for a double hit by Baltimore Orioles batter Manny Machado in the sixth inning at Fenway Park in Boston on Saturday, September 22, 2012. New England Patriots wide receiver Danny Amendola (80) dives into the end zone on a 15-yard touchdown reception in the second quarter of the AFC Divisional Playoff game against the Baltimore Ravens at Gillette Stadium in Foxborough, Massachusetts on January 10, 2015.